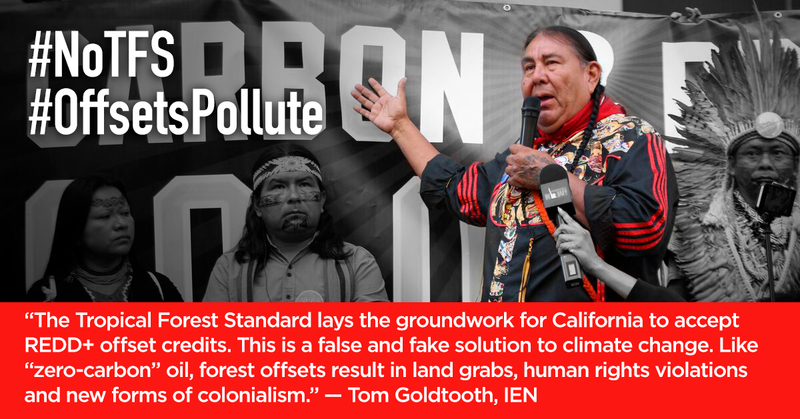 California’s Tropical Forest Standard (TFS) is a threat to the earth and to Indigenous Sovereignty and Self-Determination. 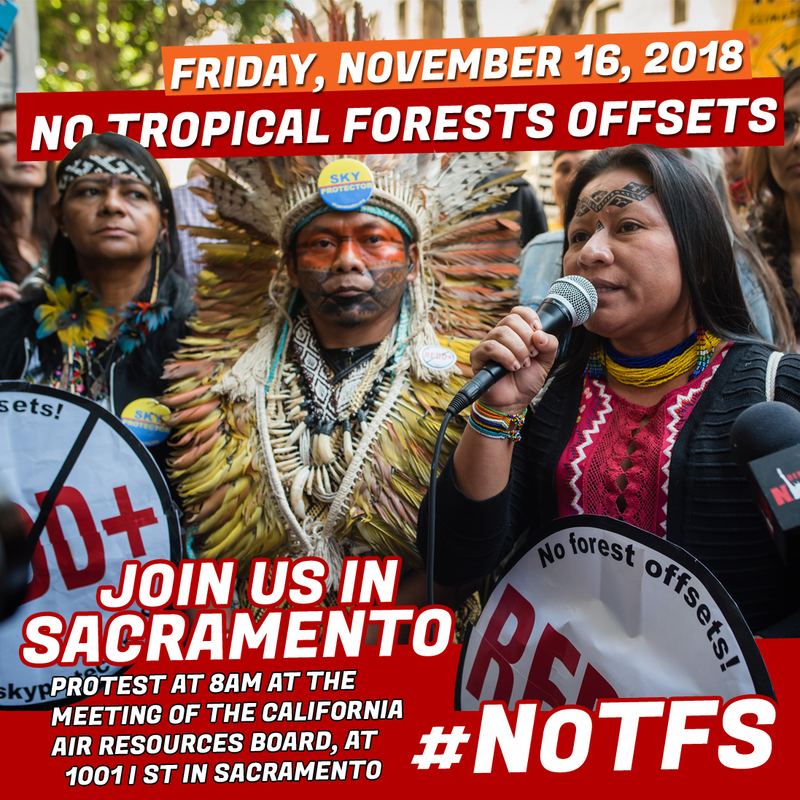 Join us at the California Air Resources Board (CARB) meeting on November 16, 2018 to say NO to the Tropical Forest Standard. The California Cap-and-Trade program, launched in 2013, is one of a set of policies the state uses in its program to lower greenhouse gas emissions. In this market-based approach, a government sets a cap on the total amount of carbon emissions it will allow. It then sells carbon allowances to power plants and other polluters. These allowances give companies a right to emit a share of the total amount of emissions the state permits. Companies can buy carbon offset credits. These count as emissions reductions by enabling emitters to pay for decarbonizing activities elsewhere. If companies don’t use all of their allowances, they can sell or bank them. Companies that exceed their emissions quotas can purchase allowances from others. This is carbon trading. It does not keep oil in the ground or lead us away from fossil fuel use. It is a false solution to climate change. On September 5, 2018, the California Air Resources Board (CARB) released a draft California Tropical Forest Standard (TFS). This is a carbon trading mechanism designed to swop off carbon emissions under the guise of protecting tropical forests. 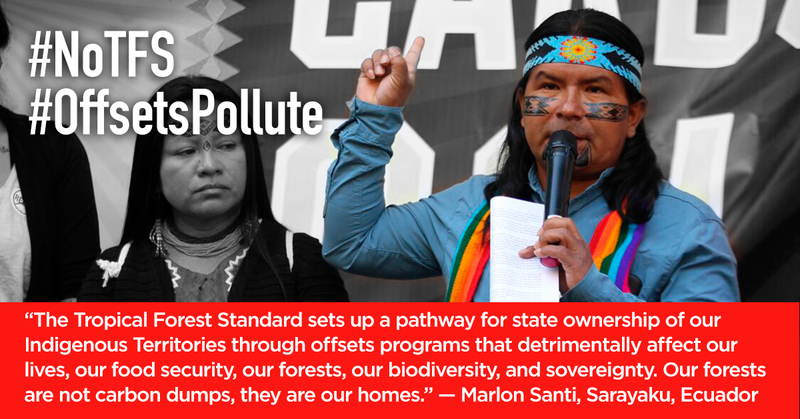 The standard would include the Reducing Emissions from Deforestation and Forest Degradation program (REDD+) in California’s cap-and-trade scheme. 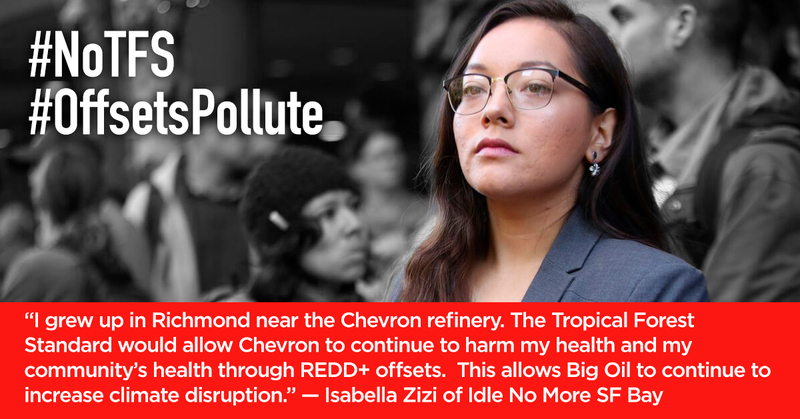 It provides a loophole for the oil industry to keep drilling and allows pollution in California to continue. It uses tropical forests as a sink for California’s carbon emissions. The REDD program has been in existence for about ten years, and it is a failure. 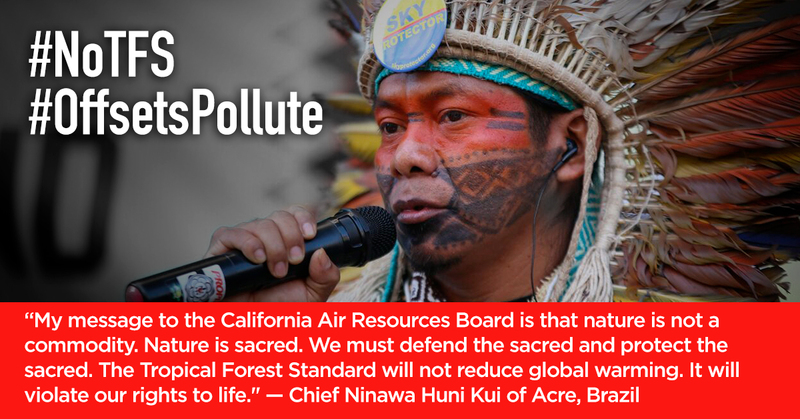 It violates the rights of Indigenous peoples whose survival depends on the forests. Moreover, it has been proven that carbon markets do not work to reduce emissions. You can read about REDD here. A campaign is underway to fight the TFS. CJA and a number of member groups and allies, including Idle No More SF Bay, CEJA Action, the Asian Pacific Environmental Network (APEN), Indigenous Environmental Network, Women’s Earth and Climate Action Network, Friends of the Earth U.S., Rainforest Action Network, Amazon Watch, the Center for Biological Diversity, and others are actively working to persuade the CARB not to accept this dangerous extension of an already bad program. Invite your facebook friends to join. Use the hashtags #NoTFS and #CommunitiesNotCorporations to spread the word on twitter. Share photos and images from the rally on Instagram.